Background Kinetic energy (Ekin) increases with speed by the power of 2 and is considered a major risk factor for injuries in alpine ski racing. There is no empirical knowledge about the effect of ski geometry on Ekin. Consequently, the aim of this study was to investigate the influence of sidecut radius on the progress of Ekin while skiing through a multigate section in giant slalom (GS). 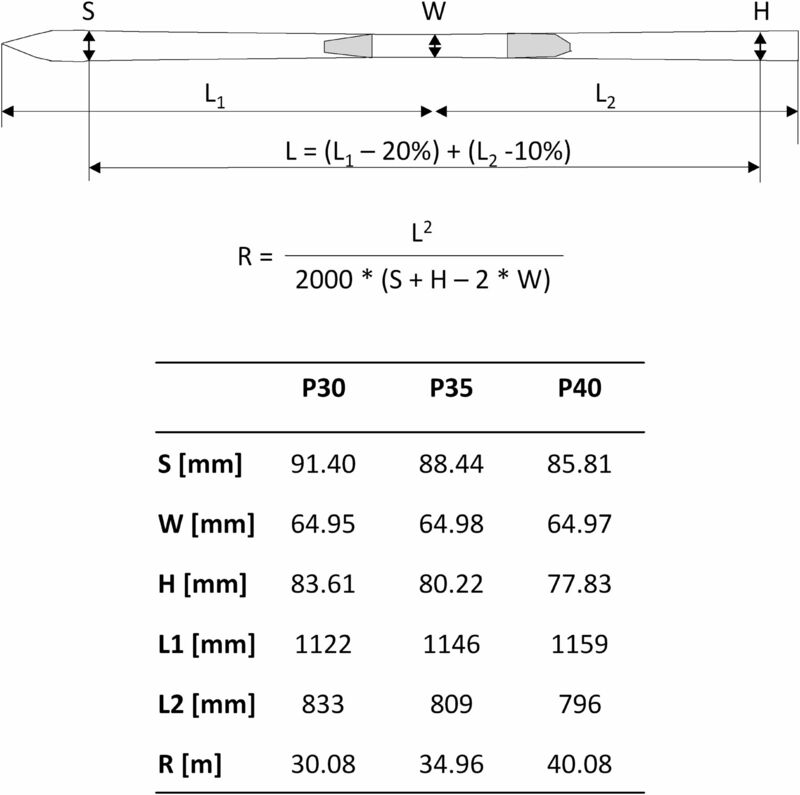 Methods 5 European-Cup level athletes skied on three different pairs of GS skis varying in sidecut radii (30, 35 and 40 m). Each athlete's position over time within a six gate section (including flat and steep terrain) was captured by the use of a differential Global Navigational Satellite System. Ekin, speed, time and path length were analysed for each pair of skis used. Results When using skis with greater sidecut radius, average Ekin was significantly lower over the entire six gate section, but not locally at every turn cycle. Particular decreases of Ekin were observed for both turns on the flat terrain, as well as for the turn at the terrain transition and the first turn on the steep terrain. The observed decreases in Ekin were found to be primarily explainable by increases in turn time. Conclusions With respect to typical sport mechanisms that cause severe knee injuries, using skis with greater sidecut radius potentially provides additional injury preventative gain, particularly in specific areas within a run. However, this injury preventative gain during falls in GS should not be overestimated. To the best of our knowledge, no studies have so far addressed the influence of sidecut radius on Ekin in alpine ski racing. However, it is important to know how the previously suggested injury prevention measure, the sidecut radius,4 ,8 influences the skier's speed and therefore, Ekin in general. Owing to tactical reasons9 in skiing, it is hypothesised that the differences within each section could locally be different.10 Hence, the aim of the current study was to investigate the effect of sidecut radius on the characteristics of Ekin within a multigate section in giant slalom (GS). Five male European-Cup level athletes skied four runs on a 12 gate water-injected GS course with three different ski prototypes (ie, 12 runs per athlete). To ensure constant slope conditions, the experiment was conducted on three consecutive days within a particular time window of 6:30 to 10:30 and 24 runs/day (2 athletes/day). The nights prior to the test runs were characterised by temperatures between −3°C and −10°C, and sufficient thermal radiation for snow freezing. The three different ski prototypes varied in sidecut radius (30 m≙P30, 35 m≙P35, 40 m≙P40) based on the theoretical consideration that next to flexural and torsional stiffness, the sidecut radius affects the ski’s self-steering behaviour.11 ,12 The most important geometrical properties of the prototypes are presented in figure 1. All other properties were in accordance with the equipment specifications of International Ski Federation (FIS).13 To ensure the same flexural stiffness among all skis, flexural stiffness was assessed and the results depicted no meaningful differences. In order to become familiarised to the different skis, the athletes used these skis for several months during their regular training sessions. 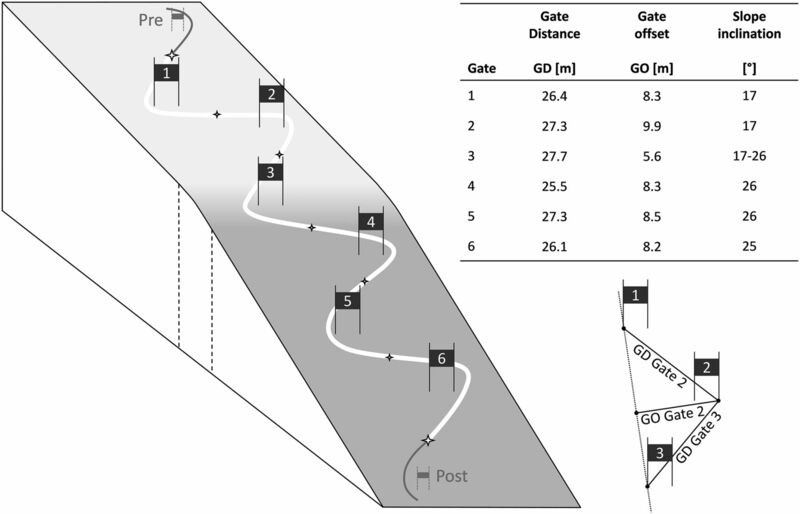 Per athlete and ski, a defined section of six gates within the two fastest runs was considered for further data analysis (in total 30 ‘six gate sections’). The six gate section had a mean gate distance of 26.7±0.8 m and a gate offset of 8.1±1.4 m, and consisted of two distinct different inclinations with one gate at the convex terrain transition (figure 2). On-hill measurement setup. Left: Schematic illustration of the six gate section. Right bottom: Illustration of the course setting characteristics, characterised by gate distance (GD) and gate offset (GO).14 Right top: Values of the course setting characteristics and the slope inclinations within the analysed six gate section. The skier's trajectory was captured by a differential global navigation satellite system (dGNSS) using GLONASS and GPS satellite signals: dual-frequency receiver α-G3T (50 Hz, Javad, USA, carried in a small backpack); antenna G5Ant-2AT1 (Antcom; USA, mounted on the skier's helmet).18 The terrain geomorphology and course setting were captured using static dGNSS: dual frequency receiver α-G3T (Javad, USA); antenna GrAnt-G3T (Javad; USA). Differential position solutions of the skier trajectory, terrain and course setting were computed using additional reference data from two base stations: α-G3T receiver (Javad, USA), GrAnt-G3T antenna (Javad, USA); and a geodetic postprocessing software (Justin, USA). The following steps were performed: (1) for comparison of Ekin at the beginning and end of the six gate section, the average values of ‘Initiation Phase Turn1’ and ‘Completion Phase Turn6’ were calculated based on a turn cycle structure definition described previously.9 ,21 Subsequently, average values for ‘Initiation Phase Turn1’ and ‘Completion Phase Turn6’ were tested for significant differences with two one-way repeated measures analysis of variance (ANOVAs) (P30/35/40; p<0.05); (2) For each athlete and ski, subject mean curves of Ekin were calculated. Based on the individual subject mean curves, group mean curves were calculated and graphically visualised as mean±SE; (3) For the average over the entire six gate section and for the average of each turn, the significance of the differences for Ekin, speed, time and path length was tested with a one-way repeated measure ANOVA (P30/35/40; p<0.05), including post hoc analysis with Bonferroni correction; (4) In case of significant differences of Ekin in the pairwise comparison for the entire section of the corresponding pair, the percentage differences in Ekin (%diffEkin), in turn time (%diffTime) and in turn path length (%diffLength) were calculated for each turn. Subsequently, statistical testing was conducted to determine whether %diffEkin differed significantly among the six turns by using one-way repeated measures ANOVAs (Turn1,2,3,4,5,6; p<0.05) including a Bonferroni corrected post hoc analysis; (5) The contribution of %diffTime and %diffLength to explain %diffEkin for each turn cycle was assessed by comparing the β weights of a multiple regression analysis (enter method, p<0.05). The time course of Ekin for the three analysed skis are presented in figure 3. 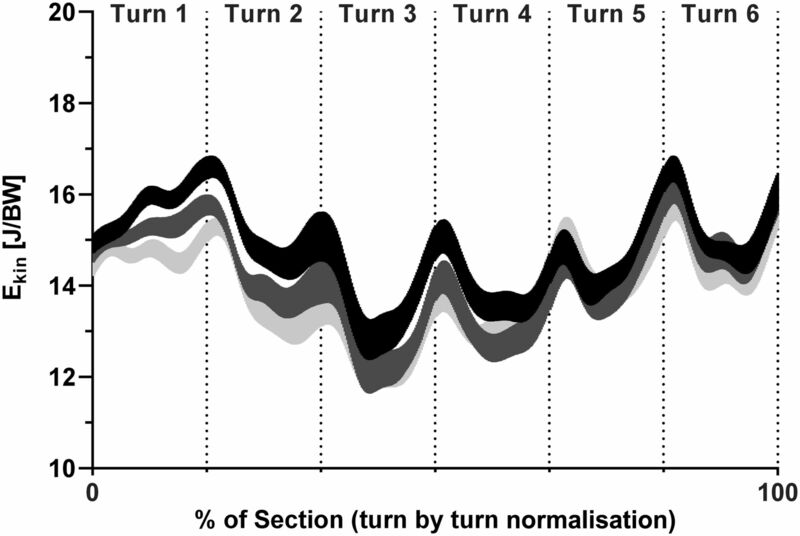 As a general trend, Ekin decreases during Turn2 and Turn3 (ie, prior and during the terrain transition), and tends to increase along the subsequent turns. Within the turns, Ekin starts with a local maximum at turn switch and decreases during the turn cycle to a local minimum around gate passage, before increasing again until the subsequent turn switch. Comparing the skis, one can observe pronounced differences for both turns in the flat terrain, as well as for the turn at the terrain transition with increasing sidecut radius. Areas of uncertainty around the estimate of the mean (±SE) illustrating Ekin for the entire six gate section. Vertical dotted lines separate the turns. (black≙P30; dark grey≙P35; light grey≙P40). As shown in table 1, this results in significant differences in the entire six gate section averages of Ekin, speed and time between P30 and P35, and between P30 and P40. No significant differences were observed for path length. Post hoc comparison of the entire six gate section did not reveal significant differences between P35 and P40. The results for Ekin separated into the single turns are presented in table 2. Significant differences between the tested skis were revealed for the turns in the flat terrain (Turn1 and Turn2), the turn at the terrain transmission and the first turn in the steep terrain, but not for Turn5 and Turn6. In the pairwise comparisons, different turns showed strong effects. When comparing P30 with P35, Turn2, Turn3 and Turn4 were mainly affected; while comparing P30 with P40, Turn1, Turn2 and Turn3 showed significant differences. The most pronounced differences were observed for P30 vs P40 (8.77% decrease in Ekin for Turn2). =0.505). A selective post hoc analysis for P30 vs P40 comparing the lowest value within the six gate section (ie, Turn2) with all other turns revealed a tendency for Turn4 (p<0.077) and significant differences for Turn5 (p<0.012) and Turn6 (p<0.030). Percentage differences in kinetic energy (%diffEkin) between P30 and P35 (Left), and between P30 and P40 (Right). Black squares show Mean±SE for each single turn. The grey curves show the instantaneous areas of uncertainty around the estimate of the mean (±SE). The bars across indicate the differences between %diffEkin. The differences shown in table 2, are highlighted in the header. (tp<0.10, *p<0.05, **p<0.01, ***p<0.001). The results of the multiple regression analysis assessing the contribution of %diffTime and %diffLength to explain the %diffEkin are presented in figure 5. For all situations significant prediction models emerged, explaining between 96.5% and 99.8% of the variance. Comparing the β weights, it becomes obvious that for all conditions, %diffTime was distinctly more relevant for predicting %diffEkin than %diffLength. Mean±SE percentage difference for turn time (circles) and path length (diamonds). Left: between P30 and P35; Right: between P30 and P40. In case of significance of the multiple regression model, for all turns the explanation rate (adjR2) and β-weights of turn time and path length are reported. (tp<0.1, *p<0.05, **p<0.01, ***p<0.001). The main findings of this study were: (1) compared to P30, average Ekin within a six gate section decreased for skis with greater sidecut radius (P30→P35=−4.1%; P30→P40=−5.6%); (2) decreases in Ekin were found to be specifically located and not constant within the entire six gate section; (3) the observed decrease in Ekin can primarily be explained by differences in turn time rather than by differences in path length, which remained constant. Although the use of a non-invasive technology (dGNSS) serves a number of advantages (eg, use of athletes’ personal equipment, no additional disturbing instrumentation), the method used in this study has one major limitation: it corresponds to a whole body approach and therefore, it is not suitable to determine knee load components (eg, compression, ab/adduction, rotation loads). Considering this limitation, Ekin on a full body level possibly does not necessarily correlate with the local joint risk factors. Moreover, due to the whole body approach it is not possible to provide more in-depth explanations on a skier's movements (eg, edging angles). For future research, additional efforts should be made to combine the method used (dGNNS) with multisegment kinematics, as has been previously suggested.22 Such research could provide more information needed to improve design and aid in injury prevention.23 Despite the limitation of the used method and the discussion, therefore, being on a rather superficial level, the study investigates for the first time the effect of equipment design on Ekin within a multigate section. Additionally, it provides fundamental knowledge about the tactical behaviour of skiers and suggests effective prevention measures; even so, these findings need further verification by epidemiological studies. From a skiing tactic point-of-view, the so called ‘velocity barrier’ seems to play a major role;26–28 from a performance perspective, a high amount of potential energy should be transformed as fast as possible into Ekin.21 ,27 However, even fast skiers will need to dissipate excess Ekin at certain points along the course28 as otherwise they would become more prone to making mistakes. This intuitive control of speed by the skiers in order to avoid mistakes is called ‘velocity barrier’.26 The actual study shows that during the six gate section, the complete potential energy was dissipated because the Ekin at the beginning and at the end of this section was essentially the same. This is most likely explainable by the ‘velocity barrier’. Comparing P30–P40 (figure 4, right), the skiers were only able to utilise the beneficial effect of the smaller sidecut radius for the flat terrain of the analysed section and for the turn at the terrain transition, resulting in Ekin differences at these gates. Within the last three gates, the inclination and therefore the amount of convertible potential energy might have been too high. If all of the available potential energy had been transformed into Ekin, the skiers would have been more prone to making mistakes. Instead of using the smaller sidecut radius to perform purely carved turns with a minimum of energy dissipation, they might have controlled their speed by intuitively increasing their amount of skidding. Thus, the ‘velocity barrier’ might also serve as an explanation for the differences in Ekin between skis with different sidecut radii. If the influence of air drag on energy dissipation is negligible and path length is the same, as observed in this study, by definition, ski-snow friction must be the major factor. In this context, the current study revealed that in sections with flat terrain or during terrain transitions, Ekin was higher while skiing on P30 than while skiing on either P35 or P40. Based on these findings, one could presume that in the aforementioned sections, skiers gained more speed while skiing on P30. This can be explained by the increased self-steering effect of skis with smaller sidecut radius, since this effect is expected to result in less ski-snow friction due to less skidding.11 ,29 However, in the subsequent steep terrain, it is reasonable that skiers generate higher ski-snow friction with P30 than with P35 and P40, since the relative differences in Ekin were found to decrease again (figure 4); One explanation for these observations might be based on the ‘velocity barrier’ described above. Recent data show that 59% of all injuries result from fall or crash situations, either from the initial impact or the subsequent tumbling/sliding.5 Ekin might be particularly important for non-lower-extremity injuries, since more than 90% of these occur while falling.5 Experiments with safety barriers depicted that acceleration values on an instrumented dummy were linearly correlated with the impact speed.30 A study comparing different disciplines showed that Ekin is almost doubled from GS to downhill.1 Thus, the observed reduction in Ekin for greater sidecut radius in GS (on average 4.1% for P30 and 5.6% for P40; up to 9% in specific phases) provides only a marginal injury prevention advantage during fall or crash situations compared to Ekin reduction efforts while skiing downhill. Finally, it has to be pointed out that the reported differences were mainly observed for the two turns in the flat terrain where speed (Ekin) was relatively high. Consequently, it can reasonably be assumed that the location of the depicted differences is meaningful with regard to severe knee injuries prevention in GS. To discuss the injury preventative gains from the observed reduction in Ekin as related to severe traumatic knee injuries, one should distinguish between fall/crash situations and the typical injury mechanisms while skiing: with respect to fall or crash situations, it can be concluded that in GS the injury preventative gain from increased sidecut radius should not be overestimated, since GS innately has distinct lower Ekin compared to other disciplines. With respect to the contribution of greater sidecut radius on the typical mechanisms of ACL injuries, potential preventative gains might only be related to specific locations of the six gate section (ie, the turns in the flat terrain and at the terrain transition). At these locations, high speed (Ekin) plausibly contributes to unexpected lateral displacement when a ski starts carving inward after catching the edge in an out-of-balance situation. When skiing on skis with increased sidecut radius within a six gate section, on average, (kinetic energy) Ekin is decreased by up to 5.6%. However, due to skiing tactic reasons (ie, ‘velocity barrier’) this is mainly because of differences at specific turns (local differences: up to 8.8%). Regarding fall or crash situations in giant slalom, the injury preventative gain from skis with greater sidecut radius with regard to severe traumatic knee injuries should not be overestimated. With respect to the typical injury mechanisms resulting in severe knee injuries in giant slalom, the observed sidecut induced reduction in speed and Ekin may provide additional injury preventative gains, at least within specific sections off the course. This study investigates for the first time the influence of an equipment-based prevention measure (the skis sidecut radius) for risk of injury from the external factor kinetic energy. It provides deeper knowledge on how kinetic energy develops within a multigate section.
. The process of injury prevention within an international sport federation–Elite Alpine ski racing as an example. Sport Orthop Traumatol 2013;29:288–96.
. Relations between different technical and tactical approaches and overall time at men's World Cup giant slalom races. Kinesiologia Slovenica 2006;12:63–9.
. Ultimate skiing. Leeds, UK: Human Kinetics, 2010. 212 p.
. Characterisation of Skiers’ Mechanics, Course Setting and Terrain Geomorphology in World Cup Alpine Skiing using Global Navigation Satellite Systems: Injury Risk, Performance and Methodological Aspects [PhD Thesis]. Norwegian School of Sport Sciences Oslo; 2014. ISBN: 978-82-502-0500-0.
. The physics of skiing—skiing at the triple point. New York: Springer Verlag, 2004.
. Differential specific mechanical energy as a quality parameter in racing alpine skiing. J Appl Biomech 2008;24:121–9.
. Turn characteristics and energy dissipation in slalom. In: Müller E, Lindinger S, Stöggl T, eds. Science and Skiing IV—Proceedings of the 4th International Congress on Science and Skiing (ICSS). Maidenhead, UK: Meyer & Meyer Sport (UK) Ltd, 2009:419–29.
. Effect of ski geometry on aggressive ski behaviour and visual aesthetics: equipment designed to reduce risk of severe traumatic knee injuries in alpine giant slalom ski racing. Br J Sports Med 2016;50:216.
. Sidecut radius and the mechanics of turning–Equipment designed to reduce risk of severe traumatic knee injuries in alpine giant slalom ski racing. Br J Sports Med 2016;50:1520. Contributors JS, JK and EM conceptualised and coordinated the study. JK, JS and MG contributed to study design and data collection. MG conducted data processing. JK, JS and HS analysed the data. All authors contributed to the intellectual content, writing of the manuscript and approved its content. Funding This study was financially supported by the International Ski Federation (FIS) and the St Moritz Health and Innovation Foundation. The funding sources had no involvement in the collection, analysis and interpretation of the data, in the writing of the report, or in the decision to submit this paper for publication.